This Chevron Twin Bed Plan is based off of the fun Rustic Barnwood bed that I built for my son that used rough cut reclaimed lumber. 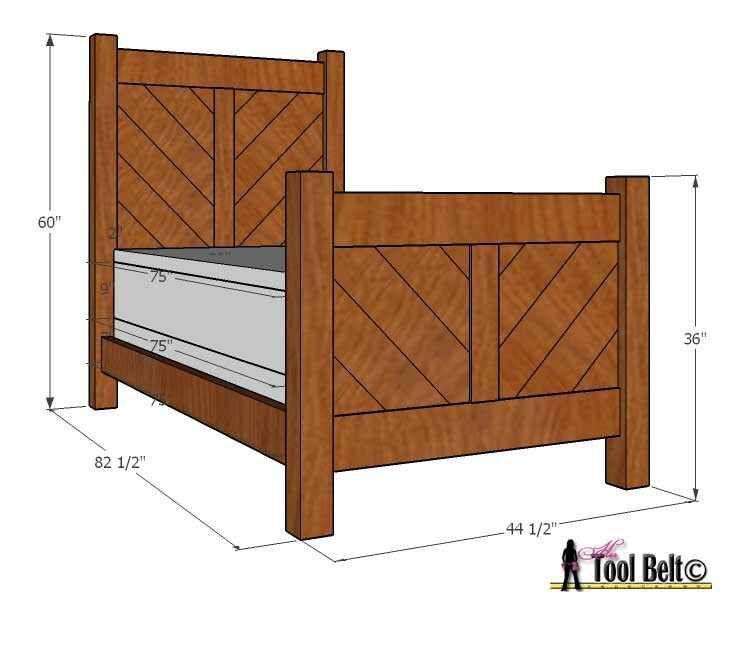 This chevron twin bed plan uses readily available lumber from the hardware store so anyone can build it. It will be cute stained or painted, antiqued or sleek. If you don’t want an entire bed, just the headboard would be a great addition to any room. Let’s get building. Tips for picking lumber: look for boards without cracks and limited knots. Pick up a board place one end on the ground and look down the board, you want as straight as possible. Flip the board 90 deg and look down the board for straightness. You may have to go through a few boards until you find the ones that you want. 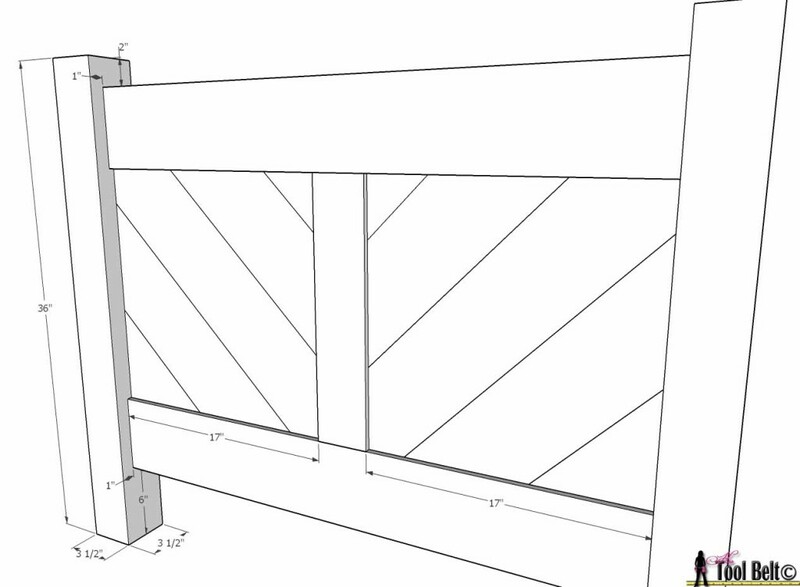 Cut 2 posts that are 3 1/2″ x 3 1/2″ x 36″. Pick the best side that you’d like showing in the front. 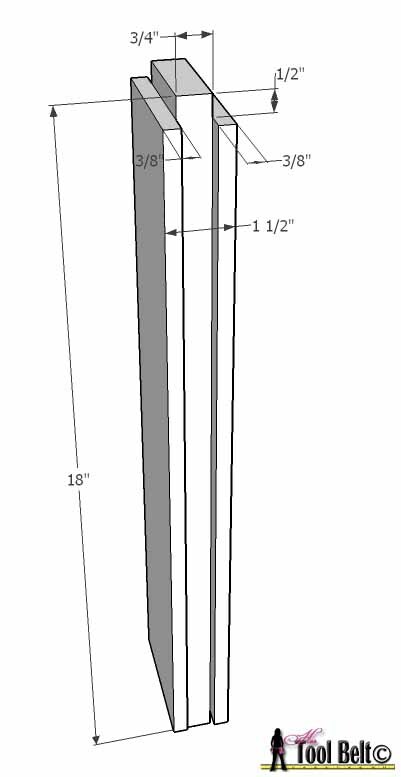 Using a table saw and dado blade, or router make a dado groove down the side of the post 1/2″ deep x 3/4″ wide and as shown in the diagram. Repeat for the other tall post, but remember to do the mirror image of the first post. The purpose of the dado groove is to hold the diagonal panels, it gives it a slick and clean look. 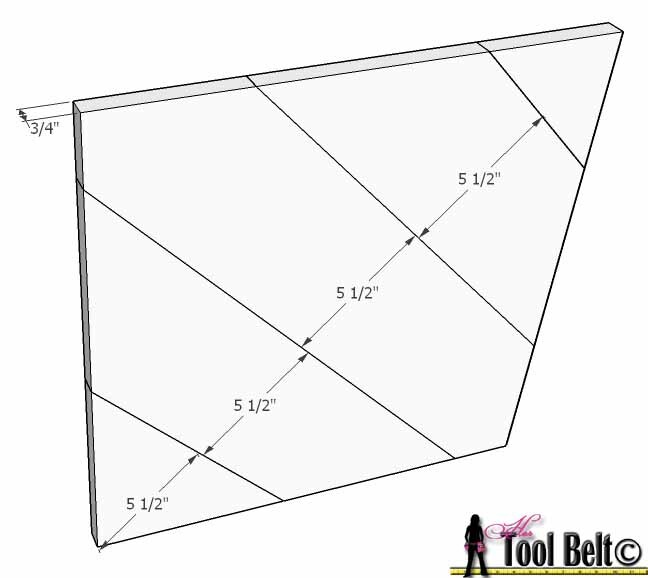 Cut 2 posts that are 3 1/2″ x 3 1/2″ x 60″. Pick the best side that you’d like showing in the front. 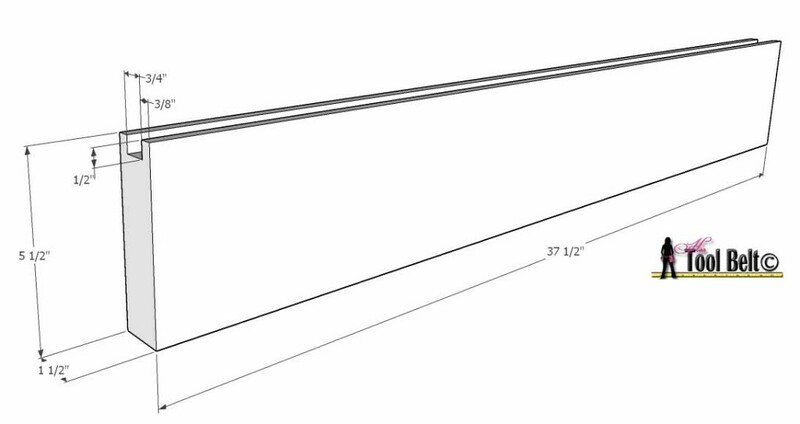 Using a table saw and dado blade, or router make a dado groove down the side of the post 1/2″ deep x 3/4″ wide and as shown in the diagram. Repeat for the other tall post, but remember to do the mirror image of the first post. Cut 4 boards that are 2″ x 6″ x 37 1/2″. Cut a 3/4″ wide x 1/2″ deep dado along the center of one long end of each board. These are the head/foot board rails. Cut a 2″ x 4″ x 18″ and a 2″ x 4″ x 42″ board. 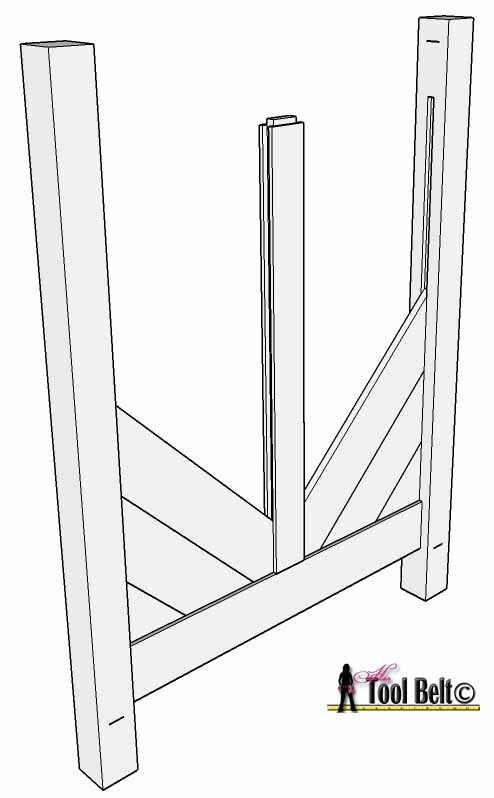 Cut a 3/4″ wide x 1/2″ deep dado along both long ends. Now we need to cut tongues that will fit into the rail dado’s that we just cut. 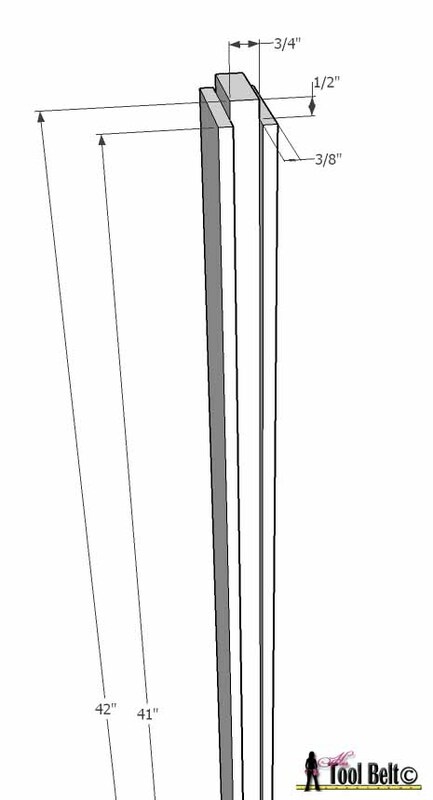 On each end make cuts to match the diagram. The tongue should fit snuggly into the rail groove, trim as necessary. These are the head/foot board center dividers. It looks complicated, but it’ll make assembly slick and easy. Cut 2 bed rails that are 2″ x 6″ x 77 1/2″. Cut 2 bed rail supports that are 1 1/2″ x 1 1/2″ x 75 1/2″. 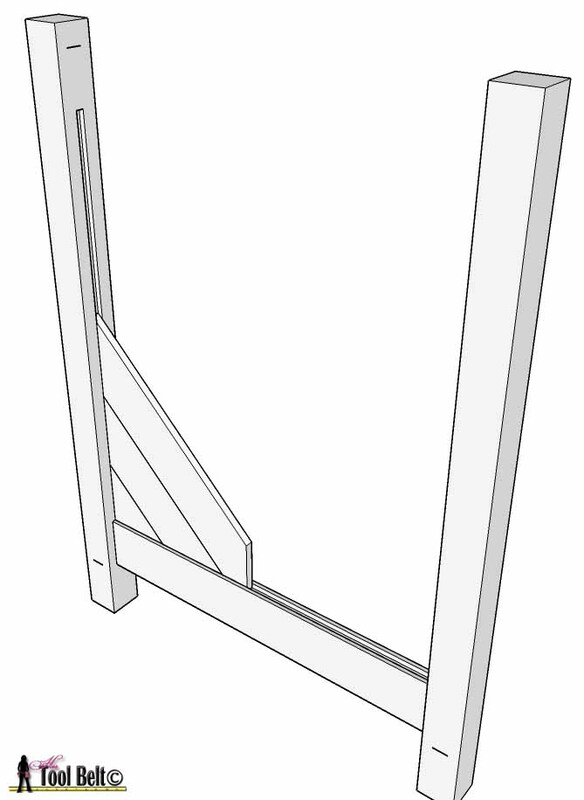 Use a Kreg Jig® R3 (affiliate) pocket hole jig and make 3 or more holes on each inside end of the bed rails. Attach the bed rail supports to the bed rails with a minimum of 5 – 2 1/2″ screws. The chevron panels are made using 1″ x 6″ boards, which actually are 3/4″ x 5 1/2″ boards. Here is a suggested cut guide. All angles are 45 deg cuts. Make the cuts just shy of the dimension give, this will give a little bit of play during assembly in the slots. 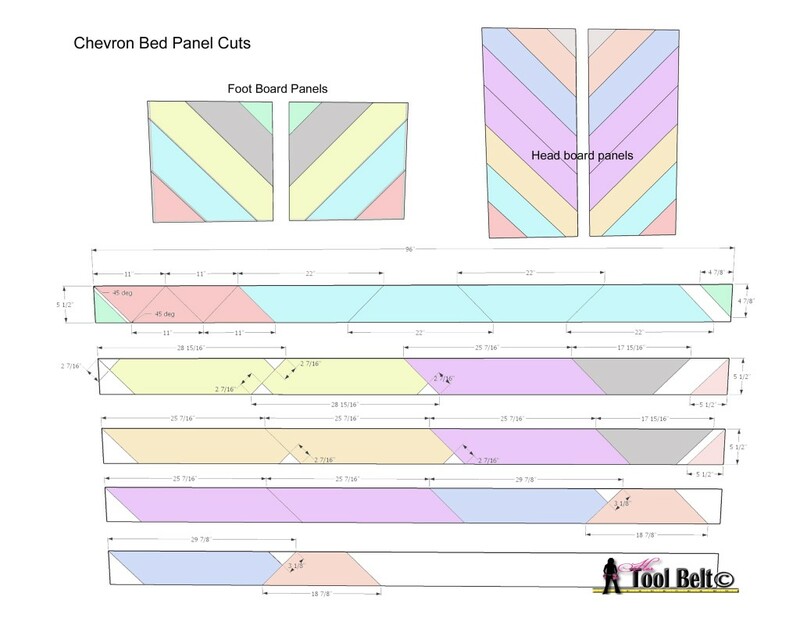 Here is a pdf version of the chevron panel cut. Once all of the chevron panel pieces are cut, use a 1/4″ round over bit or a sander and round over the edges of the panels. This will give it more of a panel look and help the boards show up better. Now we need to add pocket holes to the back side of each 37 1/2″ rail. Except for the top rail on the foot board, put the pocket holes on the backside underneath so they’ll be hidden. Now let’s dryfit everything together and make any adjustments. 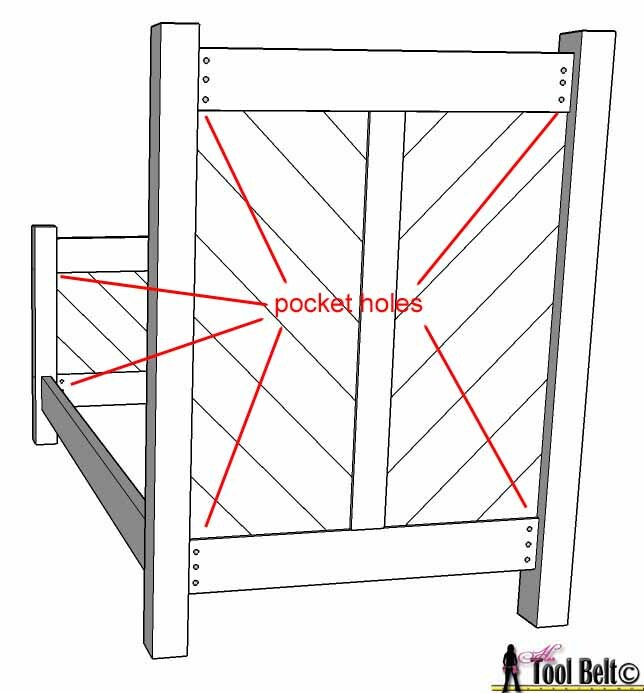 Attach the bottom rail to the posts 6″ up and secure with 2 1/2″ pocket hole screws. Stack the chevron panels. Add the divider and continue to stack the diagonal panels, then top it off with the top rail. Trim any boards as necessary. The diagonal panels will just float in the dado grooves we made. Secure the top rail with 2 1/2″ pocket hole screws. Assemble both the foot board and headboard. 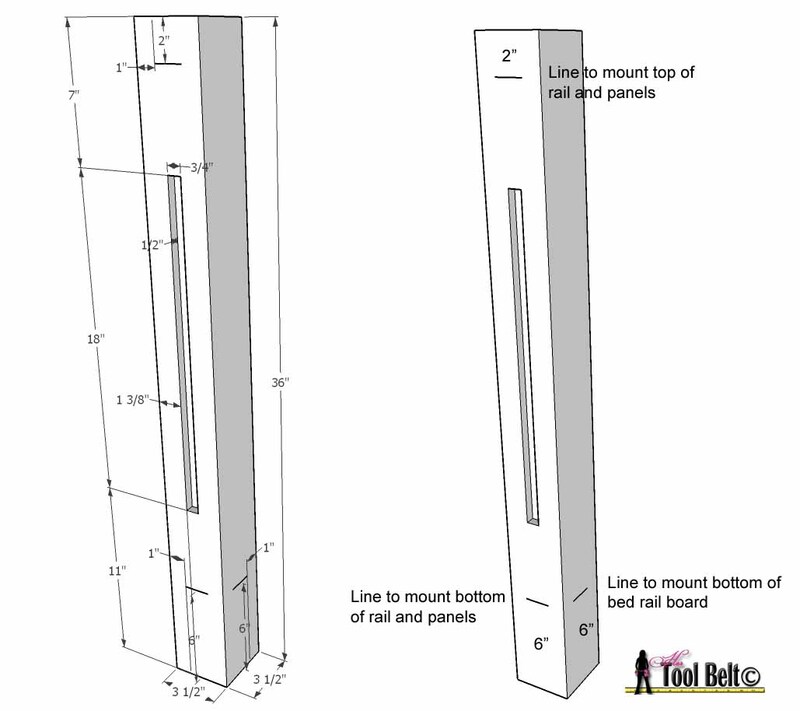 Attach the bed rails to the headboard and foot board 6″ up and secure with 2 1/2″ pocket screws. Next fill any holes or gaps with filler. If you are painting, go ahead and use spackle or joint compound (for your walls). If you are staining, use the proper wood filler. Let the filler dry then sand the bed, make sure to get any excess glue and filler smooth. End sanding your project with 120 -150 grit sand paper. Remove excess dust. If painting, prime and allow to dry. If staining, use wood preconditioner and stain as you like. Once the primer is dry, apply the paint and let dry. For the finish coat, apply with 1-2 coats of polyurethane. If painting a light color use polycrylic instead of polyurethane it dries crystal clear. And let dry sufficiently. Be sure to subscribe (right column) so you don’t miss a project. I would like to be able to download the plans. Can you make a pdf of your plans so they can be downloaded?